Who knew? South Dakota is filled with things to do. Kim and I have been surprised by how much fun we’ve had in the southwest corner of this state. 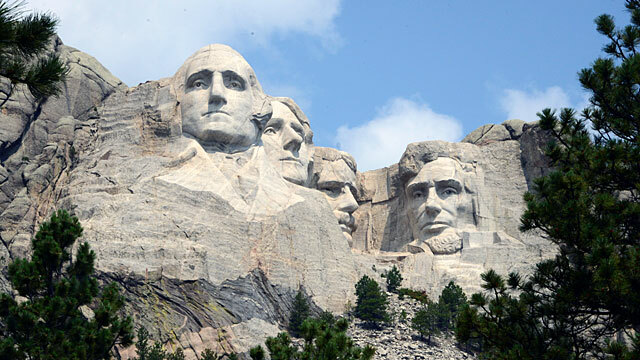 Mount Rushmore would have been neater at the start of our trip. Now we’re jaded. But that might be the least impressive thing about the Black Hills region. You see, the Black Hills are something of an anomaly. They’re 5000 square miles of mountainous terrain in western South Dakota (and parts of Wyoming). They rise like islands in the vast sea that is the Great Plains. The area is forested and dotted with lakes, so that the land looks and feels nothing at all like the prairie that surrounds it. Locals flock to the Black Hills for recreation opportunities, including boating and fishing. Most popular, however, seem to be ATVs. There are four-wheelers everywhere — even on the highway. Plus there’s the hundred-mile-long George Mickelson Trail, a multi-use path for runners and bikers that winds from Deadwood south to Edgemont. The locals also seem to like Deadwood, which in past lives was a gold-rush mecca and then a ghost town. Today, it’s like a mini Las Vegas. The town is blighted with slot machines and game tables. Want to visit the city’s historic sites? You’ll have to wade through aisles of flashing lights to do so. 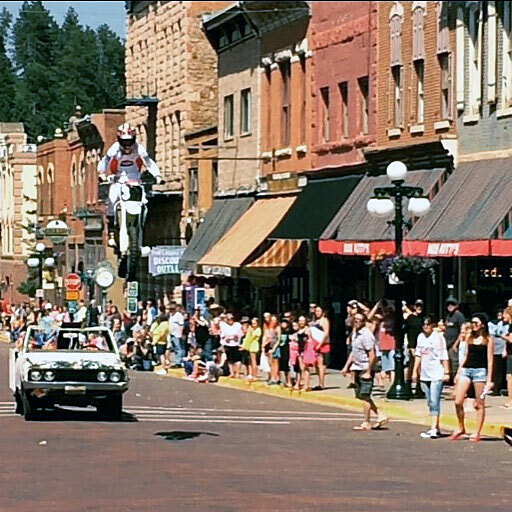 We spent Independence Day in Deadwood, which meant gunfights, horses, and motorcycle stunts. Nearby Sturgis is another huge draw, and not just for locals. Although the famous motorcycle rally only occurs one week out of the year, bikers flock to the city year-round. 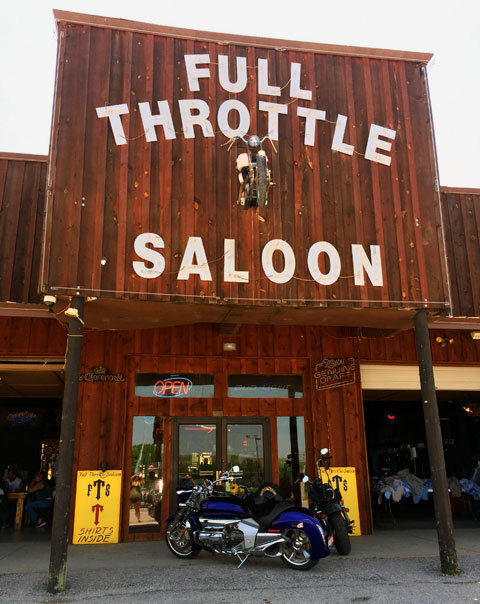 They come to visit familiar landmarks, such as the Full Throttle Saloon (the world’s largest biker bar) and the Sturgis Motorcycle Museum. 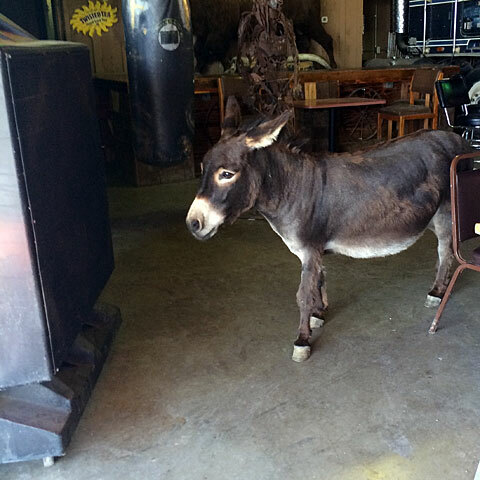 …and we both cracked up at the pet donkey that stood by the swamp cooler. 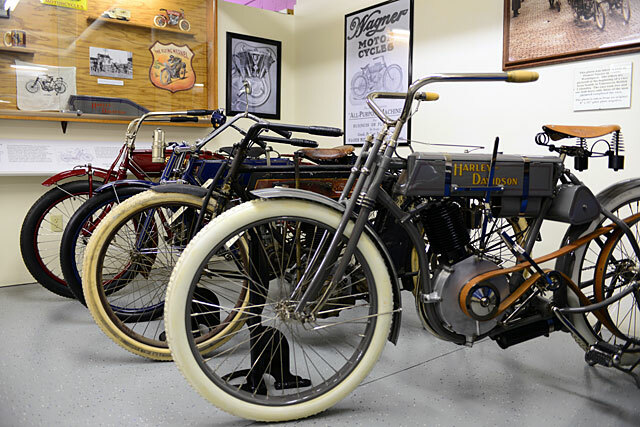 The motorcycle museum was fascinating. For out-of-towners like me and Kim, the Black Hills offer other attractions. 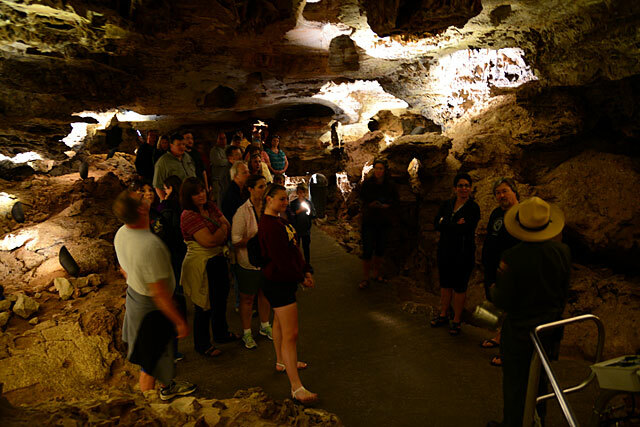 We were impressed with Wind Cave National Park, located just 45 minutes from Mount Rushmore. We both like caves, and try to visit them whenever possible. Wind Cave was cool because it was different. Instead of a small chamber filled with stalagmites and stalactites, we found a half-mile long tunnel comprising big, open rooms and unique mineral formations. “That was awesome,” Kim said when we’d finished our ninety minute tour, and I agree. It isn’t really possible to photograph just how cool these caves were. There’s plenty more to see and do in the Black Hills — including Devil’s Tower, Custer State Park, and lots of Native American history — but after five nights, we decided to hop east to the edge of Badlands National Park. Just south of Wall (home of the famous but frivolous Wall Drug Store — skip it! 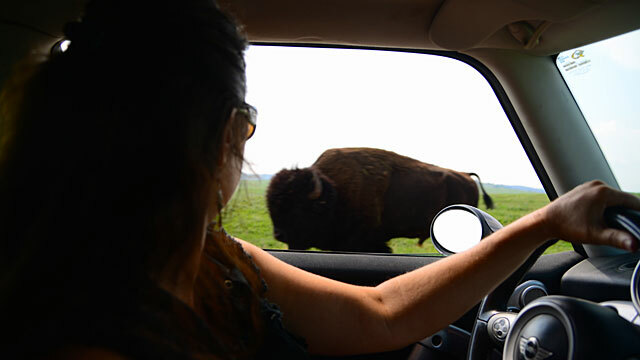 ), we pulled our motorhome onto Buffalo Gap National Grassland, where we were able to drycamp for free. We drove both of our vehicles down a sketchy dirt road until we found a place to park on the edge of a cliff overlooking the fantastic rock formations below. Our best camping spot on the trip if not for the bloodthirsty flies and mosquitoes. From there, we spent a day exploring the area. 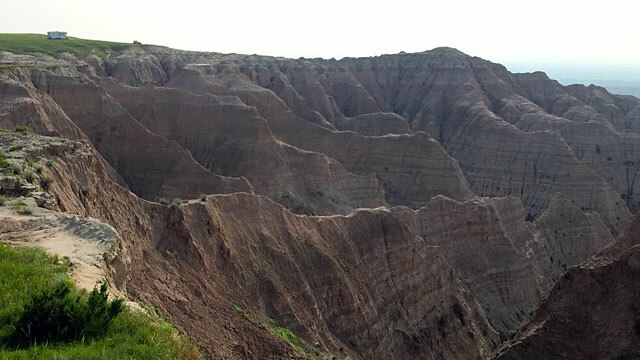 We drove into Badlands National Park and marveled at the other-worldly landscape. When you’re in the Badlands, you feel like you’re on another planet. 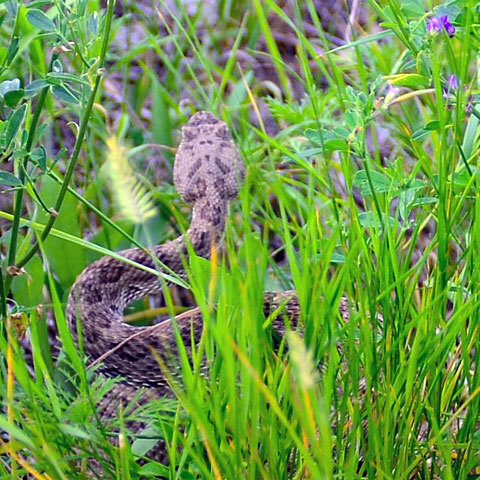 I saw my first-ever rattlesnake, which sent shivers down my spine (it was just a couple of feet away from the footpath). 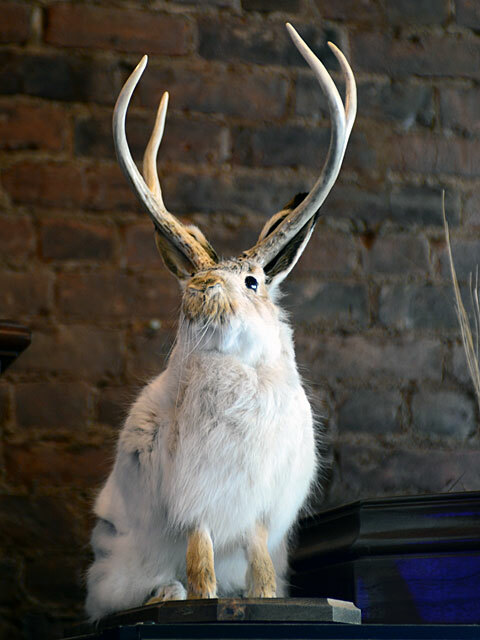 Other wildlife highlights: Bison strolling down the center of the street…and a jackalope. Rattlers don’t scare me as much as bears, but they sure ain’t cuddly. We spent less than a week in the Black Hills and the Badlands, but we both agreed we could have stayed longer. Someday, we’ll be back. Who knew South Dakota could be so much fun?